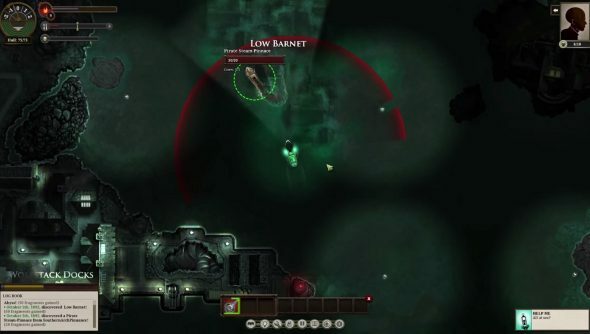 Sunless Sea is a grand old time, even when it’s extremely unsettling – a nautical adventure in an underground, Victorian sea. The game’s all about collecting stories and exploring the utterly bizarre world, but there’s combat too. It was turn-based, and clever, but ultimately the execution was a bit dull. The whole point of Early Access, if we’re being optimistic, is for developers to see what works and what doesn’t, and this has lead to them throwing the old combat system out of the nearest port hole. Failbetter Games announced the change a couple of months ago, and after a couple of weeks of testing, the Steel update is now live, providing captains with real-time high seas battles. Battles kick off by targeting and firing on an enemy in real-time, or when an enemy spots your ship. The principle of illumination remains, but now captains can sneak up on enemy monsters or ships by turning off the lights. When combat begins, the battle UI appears, and firing arcs and weapons ranges surround the ship. Firing isn’t instantaneous, either. The firing solution takes time, but can be activated early, reducing the chance of a successful hit. Illuminating the target makes the time it takes a firing solution to complete shorter. The system sounds like it retains the spirit of the turn-based version, but with a bit more dynamism since you can keep moving your ship during the battle. And judging from the video, fights are a bit quicker, too. Along with the new combat system, Failbetter has made the ocean a lot busier, adding 10 new named islands to explore – they don’t have much on them yet, though – and a slew of unnamed islands dotting the sea. Once a firing solution is over 50%, you have the option to fire. Your % through firing solution is equal to your chance to hit, meaning if you wait for 100%, you are ensured a hit.